As mentioned on the update on October 17, devotees from the state of Gujarat had arrived to Puttaparthi in large numbers to celebrate the beginning of their New Year with Swami. Their programme had not yet been confirmed and so the hall had no backdrops. But a huge welcome board, constituted with myriad colours of flowers, proclaimed, “Happy Gujarati New Year”. Interesting rangolis or designs with coloured powder had been laid on the marbled steps that lead to the stage. They were delicate and beautiful. The Veda chanting concluded at 5:00 p.m. and then the bhajans began. 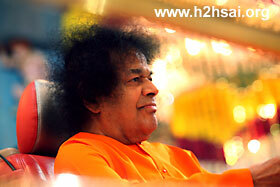 It was in middle of the bhajans at 5:25 p.m. that Swami arrived. He was welcomed by children holding lamps on either sides of the path. The children were dressed in various costumes. Swami moved across the ladies from the state and then across the gents too. Along the way, He blessed various items that the children held out. In the gents’ side, He enquired into the progress of the University buildings at Muddenahalli and saw through the pictures too. The birthday boys' region was populated by students of Gujarati origin who took the opportunity to seek His blessings and Grace on their special day. It was the same in the Primary school block too. 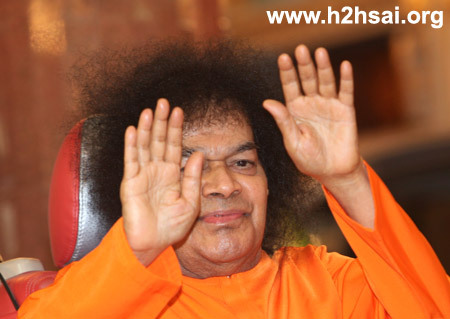 Swami was on stage listening to bhajans by 5:45 p.m. After a few bhajans, Swami called the State president of Gujarat and asked him what programmes were in store. He permitted the musical to be performed and within minutes, an area in the centre had been cleared and the music programme began. Before the performance began, all the artists came forward to offer their obeisance to Him. He blessed all of them patiently and profusely. The first part of the programme was a piece on the santoor by Sri Shyamkumar Bhonsle. Ah! 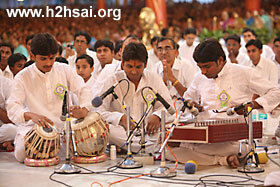 What a pleasing quality of sound the santoor produces; like the dancing flow of a gurgling brook! The difference was that the artist seemed to take everyone on a journey of the river in the reverse direction! Beginning with a gentle flow like the meandering river before it meets the sea, the tempo and gusto was built up to a crescendo like the rushing rivulet on the mountain tops. His ten minute piece was followed by a Jaltarang recital by Sri Hemant Bhosle. Now this too had 'water' all about it as the musical notes emanated from porcelain bowls filled with water to different levels. 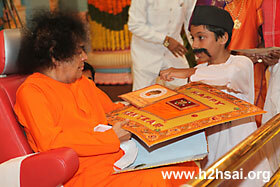 Ten minutes later, the music was complete and Swami asked, "Where is the drama?" Needless to say, the backdrops were rushed into position and all the blocks cleared for the ensuing performance. The drama turned out to be the third this month to be based on Adi Sankara! As it is said, "When it rains, it pours!" The drama had the Bhaja Govindam forming its backbone and was embellished with Swami's Chinna Kathas. The episode from Shirdi Baba's life where Baba teaches Tatya the inevitability of death and the story of the fisherman who teaches a businessman the true meaning of happiness and relaxation were well enacted. The verses from the Bhaja Govindam interspersed the drama with the saint Shankara himself singing it out and reminding everyone of the lofty goals in life. 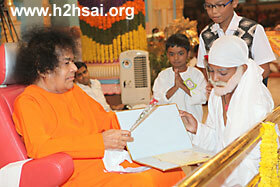 They concluded with the song Manasa Bhajore Guru Charanam and the dialogue, "Let us all get ready to go to Swami." Even as they said this, it appeared as though Swami got ready to go to them! Swami moved immediately to the interview room and brought T shirts and safari pieces. 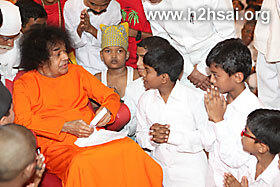 Arriving back to the stage, Swami moved down to grant the children an opportunity of a group photograph. On His way, He asked almost everyone of them their names. Most of them answered but some of them seemed so awed by His presence that all they mustered was a deep look into His eyes. 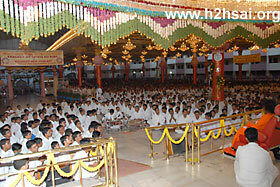 Swami then moved up the stage and blessed everyone. 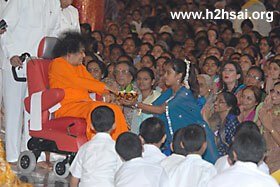 Aarthi was done and Swami retired at 7:15 p.m.